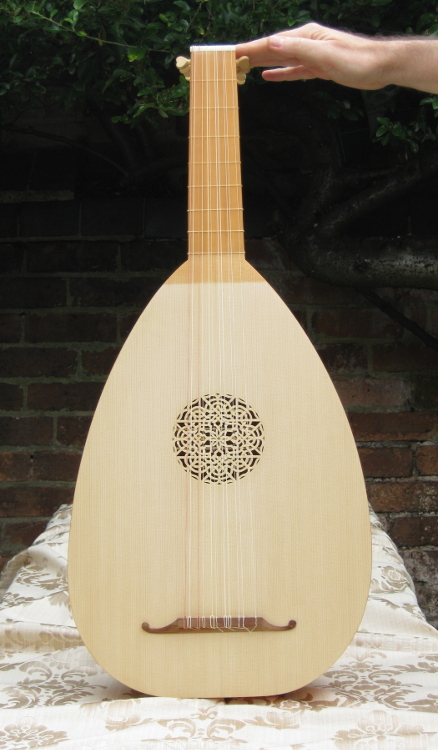 We currently offer three different models of six course lute: the Gerle (KHM Vienna, A35), the Hans Frei (KHM Vienna, C34) and an own design which is a small lute with nine ribs based on elements from the lutes of the Bologna makers Frei and Maler. 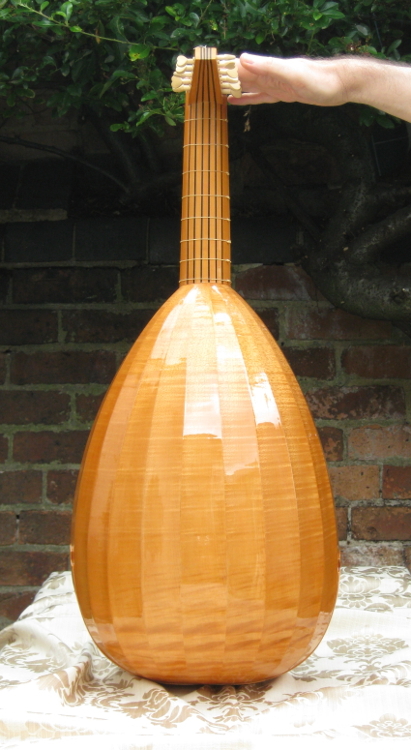 Six course lutes are available starting at £1750. See the price list for general comments on what features you can expect at the lowest price level for each model of instrument. The decorative schemes described on this page are examples only and are not comprehensive. We have tried to offer examples reflective of both lutes near or at the base price, and lutes that have more costly decorative features. 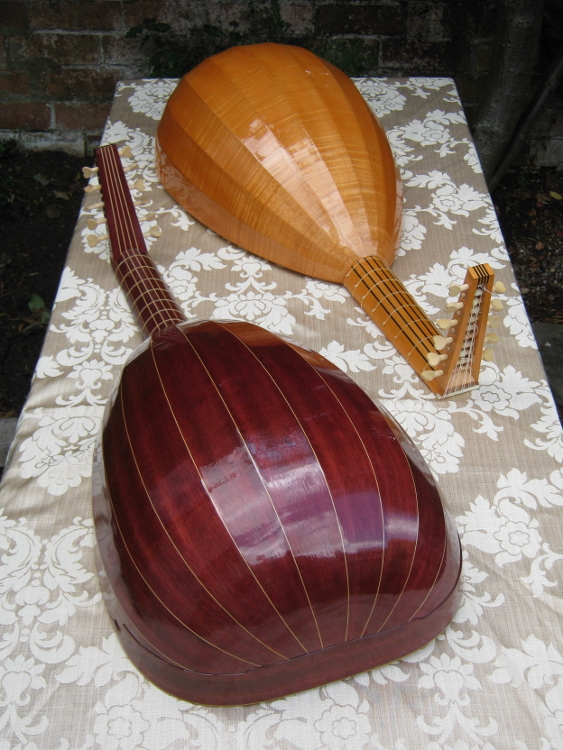 Developing from the five course lute some time in the 15th century the the six course lute became ascendant in and flourished almost throughout the entire 16th century. Due to its long and far-reaching period of dominance a vast body of music was written for it. However, despite the popularity they enjoyed in their heyday relatively little information about their construction survives today. The courses are usually tuned in intervals not dissimilar from the modern guitar, the principal differences being that they are usually double-strung from the second course, the third course is tuned a semitone down and that the most commonly encountered nominal lute pitch is higher at g rather than e. With their octave stringing from the fourth course they have a uniquely magical and ringing character. Prices start from £1750. 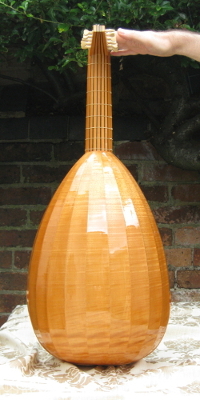 This lute based on the Gerle has a string-length of 60 centimetres. 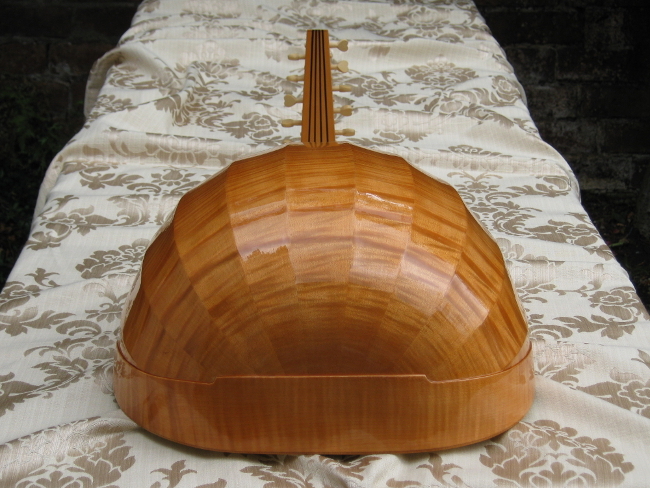 The original Gerle (one of the very few surviving six course lutes) is constructed in the untypical scheme of ivory with contrasting dark lines (we can approach a similar or negative visual treatment now by using light coloured woods in place of the ivory and ebony). Alternatively, a more historically typical scheme can be utilised. 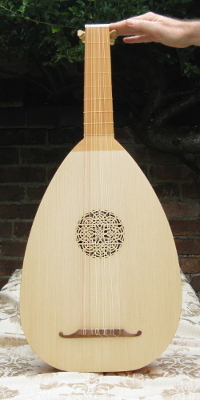 Based on Frei this lute has a minimum potential string length of 63cm. It has a long narrow shape bowl usually without spacers which is typical of the Bologna makers. 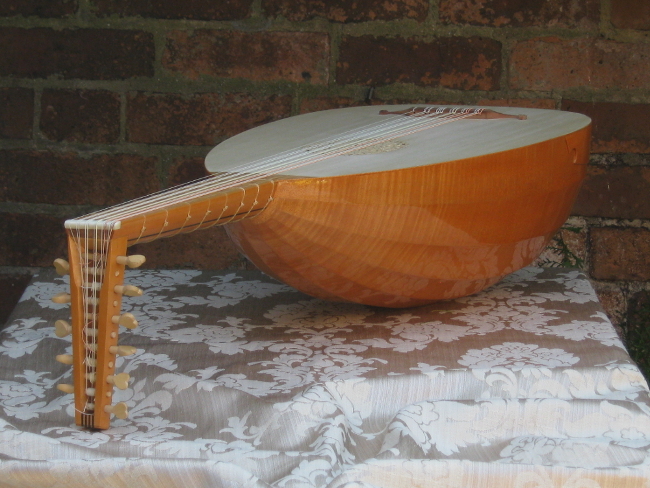 A small lute closely based on the work of the Bologna makers Frei and Maler and with a potential string length of 61 to 64 centimetres depending on pitch. 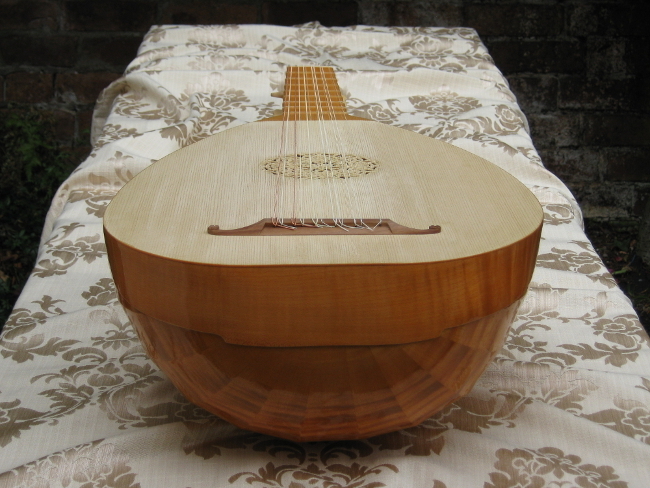 Barring schemes vary but generally it's believed that six course lutes have a slightly thicker soundboard with fewer bars than in later periods. 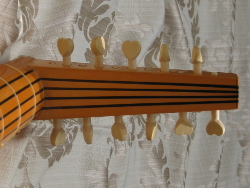 Necks on six course lutes are also somewhat deeper in section. We always use fine grade Alpine spruce no matter the cost of the instrument. 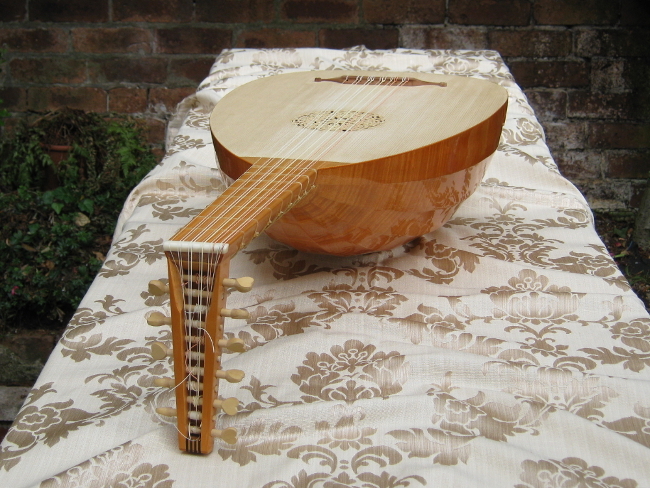 On one of our low price six course lutes you could expect a solid wood (e.g. walnut, pear, cherry etc.) neck and peg-box, carved bridge with flower ends, pegs with carved hearts, fully carved soundboard rose, oil varnished bowl (e.g. in sycamore, pear etc.). Contact us for more information. 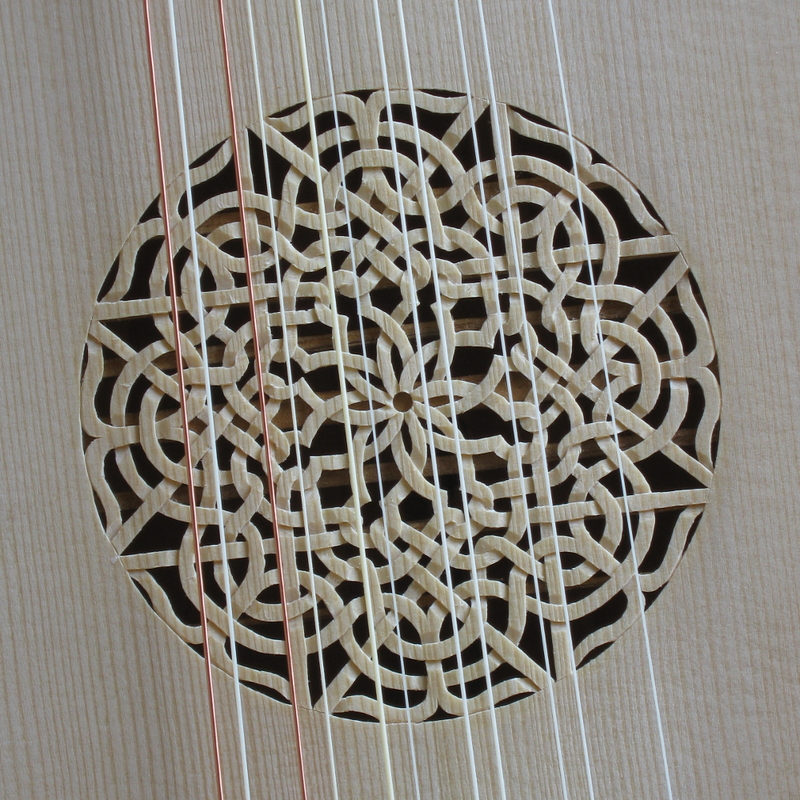 A visual scheme typical of the early sixteenth century would seem to have been a body without spacers and a plain light coloured fingerboard. The back of the neck and peg-box may or may not have decorative lines in ebony (blackened maple being an alternative to ebony) or plain maple. 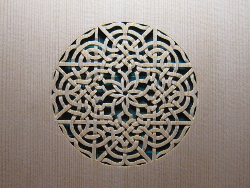 For this sort of lute back we would usually use a light and figured wood such as sycamore, maple or ash. For a slightly darker appearance a fruit-wood such as pear could be used. 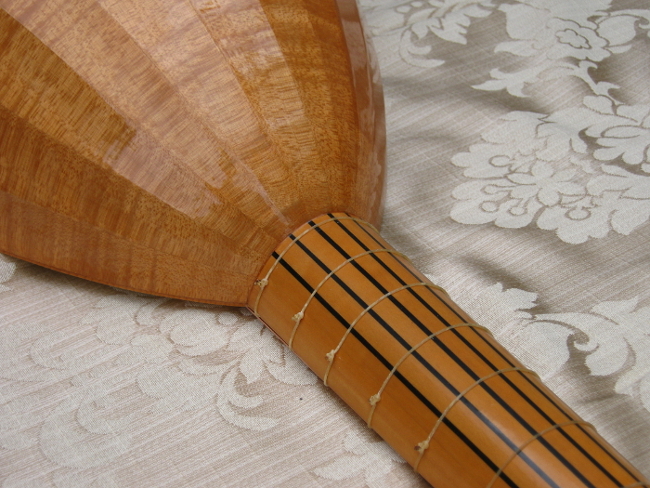 Historically the whole lute would then be given a colour varnish. If this scheme is chosen we prefer to continue the fingerboard varnish onto the soundboard to some degree but it can end at the body-neck joint. This extending of the varnish onto the soundboard is a very common feature seen in early sixteenth century iconography. 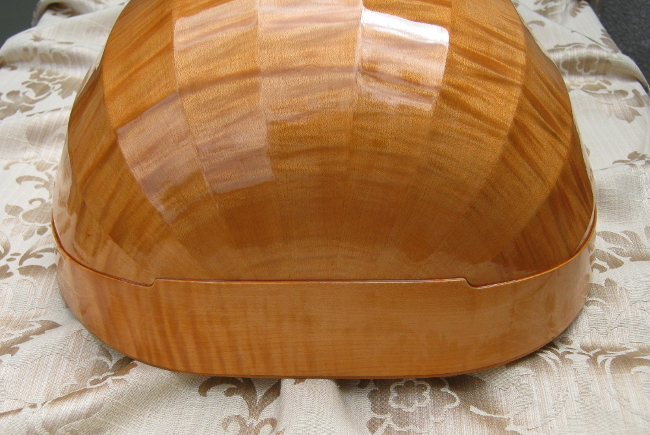 Alternatively, the varnish can be applied only to the bowl and the neck and peg-box be oiled instead. This treatment tends to look better however if the neck and peg-box are a contrasting wood to the bowl. in Lorenzo Costa's The Concert. with ebony lines and heart shaped pegs. 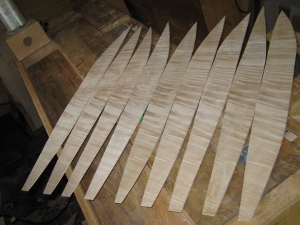 Normally we would turn and fit pegs made of boxwood or plum. 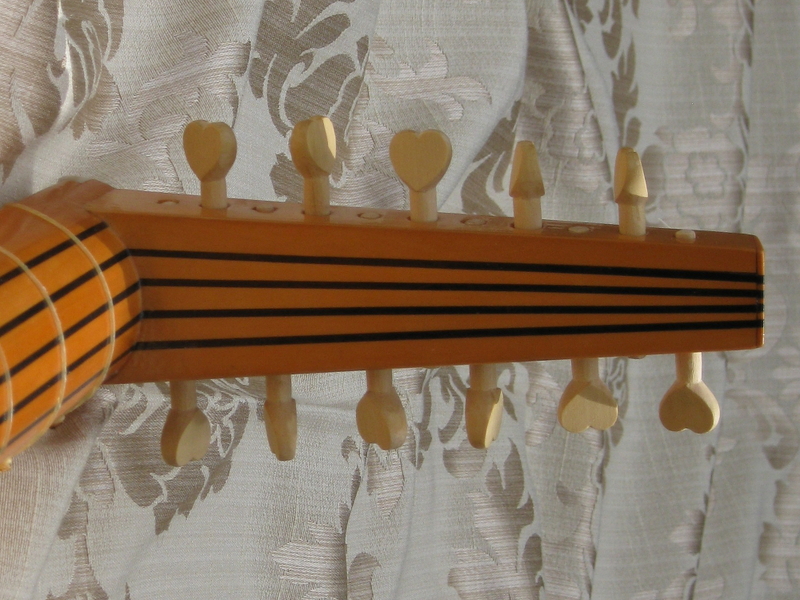 As standard the peg-heads on our six course lutes are carved hearts, but there are many other stylistically appropriate alternatives some of which are more difficult to execute. A great many rose designs were in use in this period. If required a rose can be gilded as seen in iconography. 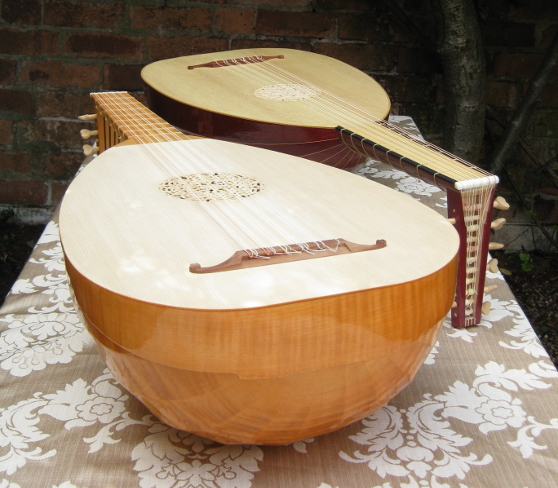 Sometimes parchment roses appear on six course lutes and these are also offered.